Scott Baxendale is a renowned luthier who began building custom instruments for Mossman Guitars in 1974. By 1978 he had joined the team at Gruhn Guitars in Nashville–one of the most well-known used, vintage, and collectible instrument dealers in the world. There, he specialized in restoring such classics, working on instruments for the likes of Johnny Cash, Hank Williams, Jr., and Billy Gibbons. Scott eventually purchased Mossman Guitars in 1985 and relocated it from Kansas to Garland, Texas. He averaged five custom builds a month, totaling over 250 acoustic guitars in a short period of time. His skill and reputation earned him an impressive clientele list, and his custom acoustics were played by Joe Walsh, Willie Nelson, and Carl Perkins, amongst others. Interestingly, Baxendale was also hired by the Hard Rock Cafe to maintain their extensive collection of historic guitars. Some of the iconic instruments he worked on include Jimi Hendrix’s Gibson Flying V, Buddy Holly’s ’57 Strat, and John Lennon’s Rickenbacker. Fast forward to 2010, and Scott Baxendale opened the shop of his namesake where he continues to build world-class custom instruments. He also started a luthiery school where he teaches “old world” craftsmanship to aspiring luthiers so that they might master the art of vintage restoration. In direct correlation with the luthiery school, the bulk of Baxendale Guitar’s business is currently comprised of “up-cycling” old department store guitars in an effort to reduce continued depletion of endangered woods. An inside look at the Baxendale conversion process. Scott and his team have developed a proprietary remanufacturing process for old Harmony and Kay guitars built between the 1920s and 1970s. Because these instruments have aged for decades, they’ve undergone a natural strengthening process that’s made them incredibly stable. However, the original instruments’ internal bracing was an afterthought in regards to tonal characteristics, which Scott and his team now replace entirely. They begin by disassembling the guitar and cleaning out the shell. Any repairs or structural issues are addressed in this stage before installing their proprietary X bracing, essentially rebuilding the body. 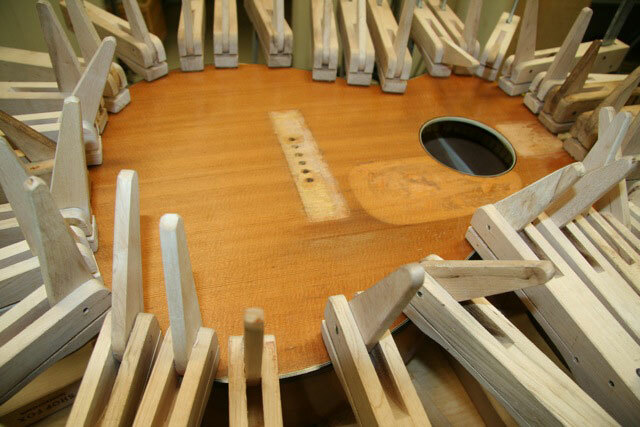 Next, they plane and radius the original neck to 14″ before reassembling the instrument and replacing the bridge, saddle, nut, and side dot inlays. A concerted effort is made to retain the instrument’s original patina. This ensures that a converted Baxendale is a naturally worn and “relic-ed” guitar, and not a faux relic with distressing added for aesthetics. Baxendale Guitar has currently remanufactured over 600 conversions for a wide variety of clients. Scott has done a masterful job of repurposing forgotten instruments and keeping classic luthiery techniques alive well into the 21st century.